The phone scans and detects the cards and the results are collected and displayed on your phone as well as stored on the website for you to review later. When a colleague described this to me, my first thought was that this could work really well with Craig Barton’s fantastic site Diagnostic Questions, which all have 4 options for answers. As with any technology in the classroom you have to ask yourself the question, “Why bother, is it any better than the low tech solution?” In this case, that has always been a set of ABCD cards which the students hold up as the question is displayed. Plickers has a significant benefit over holding up ABCD cards for the simple reason that students cannot look round and see what other students are showing and just copy them. This is a real problem. Sometimes it can be addressed by doing a countdown “3,2,1 Show me!”. But it’s a problem that Plickers nails completely. The cards are unique to students and the letters are deliberately printed very small on the front of the cards so students can’t glean anything from looking around the room. As you scan the room with your phone, you get the results appearing on your phone looking something like this. This is the best bit. You can instantly see how many are getting it right (12 in this case) and you can see significant misconceptions (B in this case). You can chose who to question based on whether they got it right or wrong. I tend to say something like “Lots of people chose B which is not the right answer. Clara, do you have any idea where they might have gone wrong?” They know if they got it right, you know, but they don’t know about each others’ answers. What I would like added here is a random name pickers, a bit like the Classtools Random Name Picker which I have used for years. The scanning functionality is impressive in that it can detect cards right at the back of the class, however the first time I used it I found that not all cards were scanned. I walked across the room effectively sweeping the students’ cards. This was fine and only took a 30 seconds or so, but my phone was still failing to detect some cards. Since then I have tried again and had better results. I think the main problem is when students have their fingers close to the pattern. Sticking the cards in the back of exercise books should help here. Even if you don’t scan every single card, it is still worth it for the quality of discussions you can have with the class as you work through the questions. Sounds good, how do I set it up? There is no actual integration between the two services which would be nice because then you could just run quizzes that are already set up in DQ. The next best thing is to take the question from DQ as an image and then upload that to the question in Plickers. You can also tell Plickers the correct answer. You don’t have to do this, but it’s useful because then you get the green / red colour coding as the answers come in. It also means you can more easily analyse the data later if you need that level of assessment. I saved all the questions I wanted in a folder somewhere and called them 1.jpg, 2.jpg, etc. so it was quick and made the next step easier. Then go over to Plickers, go the class you want and click +New Question and then Add Image. Tell it the answer (if you want) and that’s it. You need to Add the Question to the Queue just before class. 2, Display Diagnostic Questions and have Plickers running in the background. The alternative is to create a quiz on Diagnostic Questions and display the questions from there. Be sure to click this symbol at the bottom so you don’t actually have to answer them on the computer as you go. Again, if you want you can tell Plickers the answers. The easiest way I’ve found to do that is to go to Insights on Diagnostic Questions and scribble down the correct answers. Then go to Plickers and create a bunch of New Questions. Just put the question number where it says “Add question text here…” and then tick the right answer. Do it in reverse order as it puts the newest questions at the top. It would be nice if there was a more seamless integration between the two sites. Both options are a bit clunky, but don’t take more than a few minutes to do. The only other thing you need to prep is to print the pdf of the cards themselves and cut them up. Don’t make the mistake I make first time which was to trim them too small so the pupils couldn’t hold the cards without obscuring the pattern. Leave a border for fingers. Then how do I use it in class? First you need to hand out the cards to the students. The quickest way I have found to do this is to log on to Plickers, click on Classes and show them this screen. The students find their own names and you have the stack of cards from 1 to 30 and you go round the class calling out the numbers handing them out. The first time, this takes a while but it should be quicker second time if you take in the cards in the order in which they sit. An alternative which I have done is to get students to stick the cards on the back of their exercise books so they hold these up. If you are using Option 1 then you control everything from your phone. Which is nice because you can face the class. If you are using Option 2, leave Plickers running in the background and launch another window for Diagnostic Questions. Click the little Slideshow button at the bottom before you start the quiz so you don’t have to input answers into each question on the website. Then you are effectively controlling Plickers on your phone and Diagnostic Questions on the computer. If you want at the end you can go back to Plickers to display results but I think one of the real benefits of a system like this is anonymity and the fact that student responses cannot be attributed to them by other students. So this is how I have been using it so far and I’m looking forward to continuing with it this term. If you have experiences or tips for using this or other AfL tools, please do share them in the comments below. Having been inspired by some ideas from Resourceaholic and also from Robert Wilne @NCETMsecondary here, I thought I’d create these True or False cards for use with Year 7. 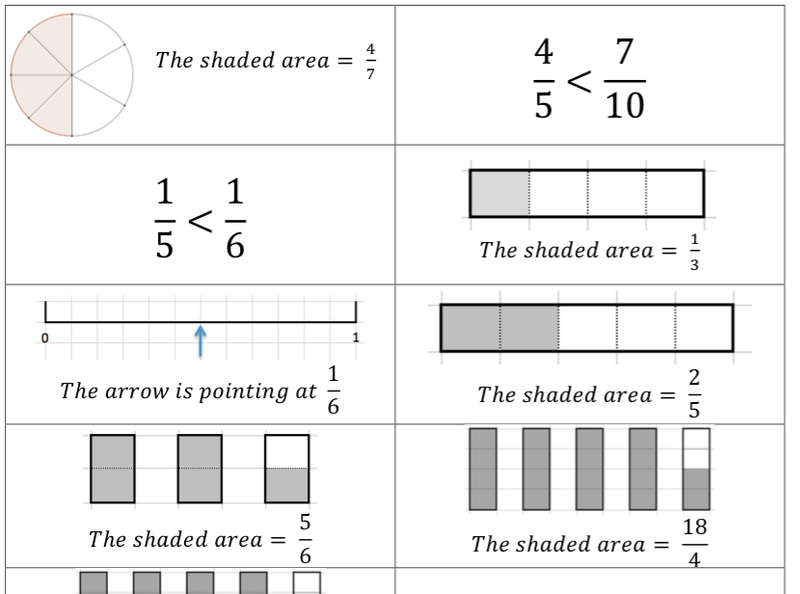 We have covered fraction of an amount, equivalent fractions, adding fractions, and top heavy / mixed numbers so far, but you could easily adapt these if you want to include, for example, multiplying and dividing fractions. I designed the false ones first which really got me thinking about misconceptions that I think could be occurring. The true ones were relatively straightforward after that. Enjoy!